(In theaters, October 2006) We’ve been waiting a long time for the 2006 Oscar contenders and now that fall is here, they’re finally starting to come out of the woodwork. First up: A gritty Boston-flavoured remake of the fabulous Infernal Affairs by none other than Martin Scorsese. For once, the remake is worth it: The plot beats remain intact but the sequences are generally different, the Boston setting infuses every character and the dialogue is beyond delicious. While the impact of the concept is wasted on Infernal Affairs fans (I do miss the conference table scene), the pieces of this intricate double-cross game are moved with skill and the film-making aspect of the end product is very slick. Mark Whalberg and Alec Baldwin are flashy with their aggressive dialogue, but even they take a second role to the combined star power of Matt Damon, Leonardo Di Caprio and Jack Nicholson: For once, the hype is real and the actors truly live up to their reputation. 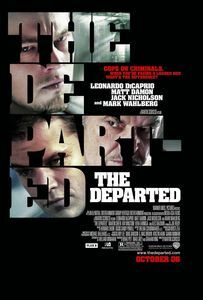 This may or may not be Scorsese’s best film since Casino, but it’s certainly in the top list for 2006.